(a) ‘Equipment'’ means machines, apparatus, fixed or mobile devices, control components and instrumentation thereof and detection or prevention systems which, separately or jointly, are intended for the generation, transfer, storage, measurement, ►C1 control and conversion of energy and/or the processing ◄ of material and which are capable of causing an explosion through their own potential sources of ignition. (c) ‘Components'’ means any item essential to the safe functioning of equipment and protective systems but with no autonomous function. Equipment group I applies to equipment intended for use ►C2 in underground parts of mines, and in those parts of ◄ surface installations of such mines, liable to be endangered by firedamp and/or combustible dust. — the equipment covered by Article 223 (1) (b) of the Treaty. 1. Member States shall take all appropriate measures to ensure that the equipment, protective systems and devices referred to in Article 1 (2) to which this Directive applies may be placed on the market and put into service only if, when properly installed and maintained and used for their intended purpose, they do not endanger the health and safety of persons and, where appropriate, domestic animals or property. 2. The provisions of this Directive shall not affect Member States' entitlement to lay down, in due observance of the provisions of the Treaty, such requirements as they may deem necessary to ensure that persons and, in particular, workers are protected when using the equipment, protective systems, and devices referred to in Article 1 (2) in question provided that this does not mean that such equipment, protective systems, or devices are modified in a way not specified in the Directive. 3. At trade fairs, exhibitions, demonstrations, etc., Member States shall not prevent the showing of equipment, protective systems, or the devices referred to in Article 1 (2) which do not conform to the provisions of this Directive, provided that a visible sign clearly indicates that such equipment, protective systems, and devices referred to in Article 1 (2) do not conform and that they are not for sale until they have been brought into conformity by the manufacturer or his authorized representative established in the Community. During demonstrations, adequate safety measures shall be taken to ensure the protection of persons. Equipment, protective systems, and the devices referred to in Article 1 (2) to which this Directive applies must meet the essential health and safety requirements set out in Annex II which apply to them, account being taken of their intended use. 2. Member States shall not prohibit, restrict or impede the placing on the market of components which, ►C1 accompanied by a written attestation of conformity as referred to in Article 8(3) ◄ , are intended to be incorporated into equipment or protective systems within the meaning of this Directive. — the components referred to in Article 4 (2), accompanied by the certificate of conformity referred to in Article 8 (3). In the absence of harmonized standards, Member States shall take any steps which they deem necessary to bring to the attention of the parties concerned the existing national technical standards and specifications regarded as important or relevant to the proper implementation of the essential health and safety requirements in Annex II. 2. Where a national standard transposing a harmonized standard, the reference for which has been published in the Official Journal of the European Communities, covers one or more of the essential health and safety requirements, the equipment, protective system, device referred to in Article 1 (2), or the component referred to in Article 4 (2), constructed in accordance with that standard shall be presumed to comply with the relevant essential health and safety requirements. Member States shall publish the references of national standards transposing harmonized standards. 3. Member States shall ensure that appropriate measures are taken to enable the social partners to influence the process of preparing and monitoring the harmonized standards at national level. 2. The Commission may adopt any appropriate measure with a view to ensuring the practical application in a uniform manner of this Directive in accordance with the procedure laid down in paragraph 3. 3. The Commission shall be assisted by a standing committee (hereinafter referred to as ‘the Committee’). Where reference is made to this paragraph, Articles 3 and 7 of Decision 1999/468/EC ( 9 ) shall apply, having regard to the provisions of Article 8 thereof. 4. The Standing Committee may furthermore examine any question relating to the application of this Directive and raised by its chairman either on the latter's initiative, or at the request of a Member State. 1. ►C2 When a Member State ascertains ◄ that equipment, protective systems or devices referred to in Article 1 (2) bearing the CE conformity marking and used in accordance with their intended use are liable to endanger the safety of persons and, where appropriate, domestic animals or property, it ►C1 shall take all appropriate measures ◄ to withdraw such equipment or protective systems from the market, to prohibit the placing on the market, putting into service or use thereof, or to restrict free movement thereof. (c) shortcomings in the standards referred to in Article 5 (2). 2. The Commission shall enter into consultation with the parties concerned without delay. Where the Commission considers, after this consultation, that the measure is justified, it shall immediately so inform the Member State which took the initiative and the other Member States. Where the Commission considers, after this consultation, that the action is unjustified, it shall immediately so inform the Member State which took the initiative and the manufacturer or his authorized representative established within the Community. Where the decision referred to in paragraph 1 is based on a shortcoming in the standards and where the Member State at the origin of the decision maintains its position, the Commission shall immediately inform the Committee in order to initiate the procedures referred to in Article 6 (1). 3. ►C1 Where equipment, a protective system or a device referred to in Article 1(2) which ◄ does not comply bears the CE conformity marking, the competent Member State shall take appropriate action against the person(s) having affixed the marking and shall so inform the Commission and the other Member States. communicate the dossier provided for in Annex VIII, paragraph 3, to a notified body, which shall acknowledge receipt of it as soon as possible and shall retain it. In addition to the procedures referred to in paragraph 1(a), (b) and (c), the manufacturer or his authorized representative established in the Community may also, in order to affix the CE marking, follow the procedure relating to CE unit verification (referred to in Annex IX). 2. The provisions of 1(a) or 1(d) above shall be used for conformity assessment of autonomous protective systems. 3. The procedures referred to in paragraph 1 shall be applied in respect of components as referred to in Article 4 (2), with the exception of the affixing of the CE marking. ►C1 A written attestation shall be issued by the manufacturer ◄ or his authorized representative established in the Community, declaring the conformity of the components with the provisions of this Directive which apply to them and stating their characteristics and how they must be incorporated into equipment or protective systems to assist compliance with the essential requirements applicable to finished equipment or protective systems. 4. In addition, the manufacturer or his authorized representative established in the Community may, in order to affix the CE marking, follow the procedure relating to internal control of production (referred to in Annex VIII) with regard to the safety aspects referred to in point 1.2.7 of Annex II. 5. Notwithstanding the previous paragraphs, the competent authorities may, on a duly justified request, authorize the placing on the market and putting into service on the territory of the Member State concerned of the equipment, protective systems and individual devices referred to in Article 1 (2) in respect of which the procedures referred to in the previous paragraphs have not been applied and the use of which is in the interests of protection. 6. Documents and correspondence relating to the procedures referred to in the abovementioned paragraphs shall be drawn up in one of the official languages of the Member States in which those procedures are being applied or in a language accepted by the notified body. (a) ►C1 Where the equipment, protective systems and devices referred to in Article 1(2) are ◄ subject to other Community Directives covering other aspects which also provide for the affixing of the CE marking referred to in Article 10, that marking shall indicate ►C1 that the equipment, protective systems and devices referred to in Article 1(2) are ◄ also presumed to conform with the provisions of those other Directives. 1. Member States shall notify the Commission and the other Member States of the bodies which they have appointed to carry out the procedures referred to in Article 8, together with the specific tasks which these bodies have been appointed to carry out and the identification numbers assigned to them beforehand by the Commission. 2. Member States shall apply the criteria laid down in Annex XI in assessing the bodies to be indicated in such notification. Bodies meeting the assessment criteria laid down in the relative harmonized standards shall be presumed to fulfil those criteria. 3. A Member State which has approved a body must withdraw its notification if it finds that the body no longer meets the criteria referred to in Annex XI. It shall immediately inform the Commission and the other Member States accordingly. 1. The CE conformity marking shall consist of the initials ‘CE'’. The form of the marking to be used is shown in Annex X. The CE marking shall be followed by the identification number of the notified body where such body is involved in the production control stage. 2. 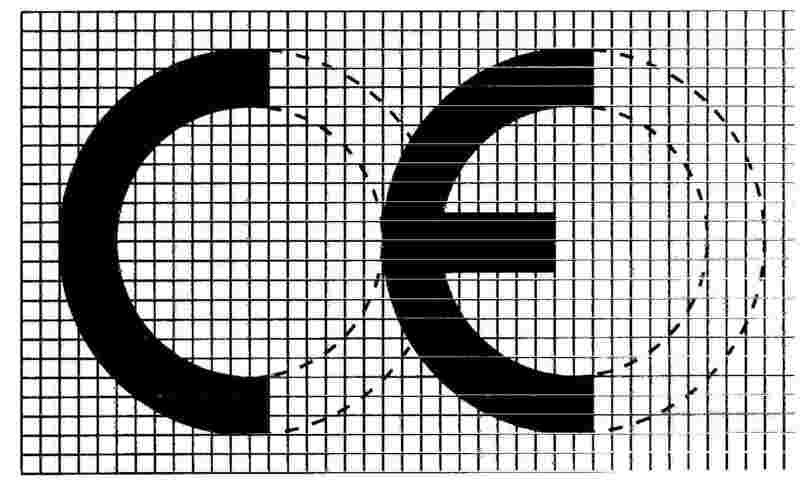 The CE marking shall be affixed distinctly, visibly, legibly and ►C1 indelibly to equipment, protective systems and devices referred to in Article 1(2) ◄ , supplementary to the provisions of point 1.0.5. of Annex II. 3. The affixing of ►C1 markings on the equipment, protective systems or devices referred to in Article 1(2) ◄ which are likely to deceive third parties as to the meaning and form of the CE marking shall be prohibited. Any other marking may be affixed to ►C1 the equipment, protective systems or devices referred to in Article 1(2) ◄ , provided that the visibility and legibility of the CE marking is not thereby reduced. (b) in the event of continuing non-conformity, the Member State must take all appropriate measures to restrict or prohibit the placing on the market of the product in question or to ensure that it is withdrawn from the market in accordance with the procedures laid down in Article 7. Any decision taken pursuant to this Directive which restricts or prohibits the placing on the market and/or the putting into service or requires the withdrawal from the market of equipment, a protective system, or a device referred to in Article 1 (2) shall state the exact grounds on which it is based. Such a decision shall be notified forthwith to the party concerned, who shall at the same time be informed of the legal remedies available to him under the laws in force in the Member State concerned and of the time limits to which such remedies are subject. Member States shall ensure that all the parties involved in the application of the Directive are bound to observe confidentiality in respect of all information obtained in the performance of carrying out their tasks. This does not affect the obligations of the Member States and of the notified bodies regarding reciprocal information and the dissemination of warnings. 1. Directive 76/117/EEC, Directive 79/196/EEC ( 10 ) and Directive 82/130/EEC shall be repealed as from 1 July 2003. 2. EC certificates of conformity to the harmonized standards obtained in accordance with the procedures laid down in the Directives referred to in paragraph 1 shall continue to be valid until 30 June 2003 unless they expire before that date. Their validity shall continue to be limited to the harmonized standards indicated in the aforementioned Directives. 3. Member States shall take the necessary action to ensure that the notified bodies which are responsible pursuant to Article 8 (1) to (4) for the assessment of the conformity of electrical equipment placed on the market before 1 July 2003 take account of the results of tests and verifications already carried out under the Directives referred to in paragraph 1. (a) Category M 1 comprises equipment designed and, where necessary, equipped with additional special means of protection to be capable of functioning in conformity with the operational parameters established by the manufacturer and ensuring a very high level of protection. Equipment in this category must comply with the supplementary requirements referred to in Annex II, 2.0.1. (b) Category M 2 comprises equipment designed to be capable of functioning in conformity with the operational parameters established by the manufacturer and ensuring a high level of protection. This equipment is intended to be de-energized in the event of an explosive atmosphere. Equipment in this category must comply with the supplementary requirements referred to in Annex II, 2.0.2. (a) Category 1 comprises equipment designed to be capable of functioning in conformity with the operational parameters established by the manufacturer and ensuring a very high level of protection. Equipment in this category must comply with the supplementary requirements referred to in Annex II, 2.1. (b) Category 2 comprises equipment designed to be capable of functioning in conformity with the operational parameters established by the manufacturer and of ensuring a high level of protection. Equipment in this category must comply with the supplementary requirements referred to in Annex II, 2.2. (c) Category 3 comprises equipment designed to be capable of functioning in conformity with the operating parameters established by the manufacturer and ensuring a normal level of protection. Equipment in this category must comply with the supplementary requirements referred to in Annex II, 2.3. B. For the devices referred to in Article 1 (2), the essential requirements shall apply only in so far as they are necessary for the safe and reliable functioning and operation of those devices with respect to the risks of explosion. Equipment and protective systems must be designed and manufactured after due analysis of possible operating faults in order as far as possible to preclude dangerous situations. — where necessary, the essential chracteristics of tools which may be fitted to the equipment or protective system. (b) The instructions must be drawn up in one of the Community languages by the manufacturer or his authorized representative established in the Community. On being put into service, all equipment and protective systems must be accompanied by a translation of the instructions in the language or languages of the country in which the equipment or protective system is to be used and by the instructions in the original language. This translation must be made by either the manufacturer or his authorized representative established in the Community or the person introducing the equipment or protective system into the language area in question. By way of derogation from this requirement, the maintenance instructions for use by the specialist personnel employed by the manufacturer or his authorized representative established in the Community may be drawn up in a single Community language understood by that personnel. (c) The instructions must contain the drawings and diagrams necessary for the putting into service, maintenance, inspection, checking of correct operation and, where appropriate, repair of the equipment or protective system, together with all useful instructions, in particular with regard to safety. (d) Literature describing the equipment or protective system must not contradict the instructions with regard to safety aspects. The materials used for the construction of equipment and protective systems must not trigger off an explosion, taking into account foreseeable operational stresses. Within the limits of the operating conditions laid down by the manufacturer, it must not be possible for a reaction to take place between the materials used and the constituents of the potentially explosive atmosphere which could impair explosion protection. Materials must be so selected that predictable changes in their characteristics and their compatibility in combination with other materials will not lead to a reduction in the protection afforded; in particular, due account must be taken of the material's corrosion and wear resistance, ►C1 electrical conductivity, mechanical strength, ageing resistance ◄ and the effects of temperature variations. Equipment and protective systems must be designed and constructed with due regard to technological knowledge of explosion protection so that they can be safely operated throughout their foreseeable lifetime. Components to be incorporated into or used as replacements in equipment and protective systems must be so designed and constructed that they function safely for their intended purpose of explosion protection when they are installed in accordance with the manufacturer's instructions. If equipment contains openings or non-tight joints, these must as far as possible be designed in ►C1 such a way that releases of gases or dusts ◄ cannot give rise to explosive atmospheres outside the equipment. Points where materials are introduced or drawn off must, as far as possible, be designed and equipped ►C1 so as to limit releases of flammable materials ◄ during filling or draining. (d) assure that ►C1 foreseeable conditions of overload do not give rise ◄ to dangerous situations. Where, for equipment and protective systems, the risks referred to in this paragraph are wholly or partly covered by other Community Directives, this Directive shall not apply or shall cease to apply in the case of such equipment and protective systems and of such risks upon application of those specific Directives. Equipment and protective systems must be so designed and constructed as to be capable of performing their intended function in full safety, even in changing environmental conditions and in the presence of extraneous voltages, humidity, vibrations, contamination and other external effects, taking into account the limits of the operating conditions established by the manufacturer. Equipment parts used must be appropriate to the intended mechanical and thermal stresses and capable of withstanding attack by existing or foreseeable aggressive substances. Safety devices must function ►C1 independently of any measurement and/or control devices ◄ required for operation. ►C1 The fail-safe principle ◄ is to be applied in general. In the event of a safety device failure, equipment and/or protective systems shall, wherever possible, be secured. Emergency stop controls of safety devices must, as far as possible, be fitted with restart lockouts. A new start command may take effect on normal operation only after the restart lockouts have been intentionally reset. Requirements in respect of devices with a measuring function for explosion protection. Where necessary, it must be possible to check the reading accuracy and serviceability of devices with a measuring function. The design of devices with a measuring function must incorporate a safety factor which ensures that the alarm threshold lies far enough outside the explosion and/or ignition limits of the atmospheres to be registered, taking into account, in particular, the operating conditions of the installation and possible aberrations in the measuring system. Manual override must be possible in order to shut down the equipment and protective systems incorporated within automatic processes which deviate from the intended operating conditions, provided that this does not compromise safety. When the emergency shutdown system is actuated, accumulated energy must be dispersed as quickly and as safely as possible or isolated so that it no longer constitutes a hazard. Where necessary, this equipment must be equipped with additional special means of protection. The requirements regarding explosion hazards arising from dust applicable to category M 1 must be applied. Protective systems must be dimensioned in such a way as to reduce the effects of an explosion to a sufficient level of safety. Protective systems must be designed and ►C1 capable of being positioned in such a way ◄ that explosions are prevented from spreading through dangerous chain reactions or flashover and incipient explosions do not become detonations. In the event of a power failure, protective systems must retain their capacity to function for a period sufficient to avoid a dangerous situation. Protective systems must not fail due to outside interference. Protective systems designed to resist or contain explosions must be capable of withstanding the shock wave produced without losing system integrity. Accessories connected to protective systems must be capable of withstanding the expected maximum explosion pressure without losing their capacity to function. The reactions caused by pressure in peripheral equipment and connected pipe-work must be taken into consideration in the planning and design of protective systems. Explosion suppression systems must be so planned and designed that they react to an incipient explosion at the earliest possible stage in the event of an incident and counteract it ►C1 to best effect, with due regard to ◄ the maximum rate of pressure increase and the maximum explosion pressure. Protective systems must be capable of being integrated into a circuit with a suitable alarm threshold so that, if necessary, there is cessation of product feed and output and shutdown of equipment parts which can no longer function safely. This module describes that part of the procedure by which a notified body ascertains and attests that a specimen representative of the production envisaged meets the relevant applicable provisions of the Directive. The application for the EC-type examination shall be lodged by the manufacturer or his authorized representative established within the Community with a notified body of his choice. — the technical documentation, as described in point 3. The applicant shall place at the disposal of the notified body a specimen representative of the production envisaged and hereinafter called ‘type’. The notified body may request further specimens if needed for carrying out the test programme. agree with the applicant the location where the examinations and necessary tests shall be carried out. Where the type meets the provisions of the Directive, the notified body shall issue an EC-type-examination certificate to the applicant. The certificate shall contain the name and address of the manufacturer, conclusions of the examination and the necessary data for identification of the approved type. ►C1 A list of the significant parts ◄ of the technical documentation shall be annexed to the certificate and a copy kept by the notified body. The applicant shall inform the notified body which holds the technical documentation concerning the EC-type-examination certificate of all modifications to the approved equipment or protective system which must receive further approval ►C1 where such changes may affect conformity ◄ with the essential requirements or with the prescribed conditions for use of the product. This further approval is given in the form of an addition to the original EC-type-examination certificate. Each notified body shall communicate to the other notified bodies the relevant information concerning the EC-type-examination certificates and additions issued and withdrawn. The other notified bodies may receive copies of the EC-type-examination certificates and/or their additions. The annexes to the certificates shall be kept at the disposal of the other notified bodies. The manufacturer or his authorized representative established in the Community shall keep with the technical documentation copies of EC-type-examination certificates and their additions for a period ending at least 10 years after the last equipment or protective system was manufactured. This module describes the procedure whereby the manufacturer who satisfies the obligations of point 2 ensures and declares that the products concerned are in conformity with the type as described in the EC-type-examination certificate and satisfy the requirements of the Directive which apply to them. The manufacturer, or his authorized representative established in the Community, shall affix the CE marking to each piece of equipment and draw up a written declaration of conformity. The CE marking shall be accompanied by the identification number of the notified body responsible for EC monitoring, as specified in Section 4. The manufacturer shall operate an approved quality system for production, final equipment inspection and testing as specified in Section 3 and shall be subject to monitoring as specified in Section 4. The manufacturer shall lodge an application for assessment of his quality system with a notified body of his choice, for the equipment concerned. — technical documentation on the approved type and a copy of the EC-type-examination certificate. The quality system shall ensure compliance of the equipment with the type as described in the EC-type-examination certificate and with the requirements of the Directive which apply to them. All the elements, requirements and provisions adopted by the manufacturer shall be documented in a systematic and orderly manner in the form of written policies, procedures and instructions. The quality system documentation must permit a consistent interpretation of quality programmes, plans, manuals and records. — the means to monitor the achievement of the required equipment quality and the effective operation of the quality system. The notified body shall assess the quality system to determine whether it satisfies the requirements referred to in Section 3.2. It shall presume conformity with these requirements in respect of quality systems which implement the relevant harmonized standard. The auditing team shall have at least one member with experience of evaluation in the equipment technology concerned. The evaluation procedure shall include an inspection visit to the manufacturer's premises. The decision shall be notified to the manufacturer. The notification shall contain the conclusions of the examination and the reasoned assessment decision. The manufacturer shall undertake to fulfil the obligations arising out of the quality system as approved and to uphold the system so that it remains adequate and efficient. The manufacturer or his authorized representative shall inform the notified body which has approved the quality system of any intended updating of the quality system. The notified body shall evaluate the modifications proposed and decide whether the amended quality system will still satisfy the requirements referred to in Section 3.2 or whether a re-assessment is required. It shall notify its decision to the manufacturer. The notification shall contain the conclusions of the examination and the reasoned assessment decision. — the quality records, ►C1 such as inspection reports and test data ◄ , calibration data, reports on the qualifications of the personnel concerned, etc. The notified body shall periodically carry out audits to ensure that the manufacturer maintains and applies the quality system and shall provide an audit report to the manufacturer. Furthermore, the notified body may pay unexpected visits to the manufacturer. During such visits, the notified body may carry out tests, or arrange for tests to be carried out, to check that the quality system is functioning correctly, if necessary. The notified body shall provide the manufacturer with a visit report and, if a test has taken place, with a test report. — the decisions and reports from the notified body which are referred to in Section 3.4, last paragraph, Section 4.3 and Secton 4.4. Each notified body shall apprise the other notified bodies of the relevant information concerning the quality system approvals issued and withdrawn. This module describes the procedure whereby a manufacturer or his authorized representative established within the Community checks and attests that the equipment subject to the provisions of point 3 are in conformity with the type as described in the EC-type-examination certificate and satisfy the relevant requirements of the Directive. The manufacturer shall take all measures necessary to ensure that the manufacturing process guarantees conformity of the equipment with the type as described in the EC-type-examination certificate and with the requirements of the Directive which apply to them. The manufacturer or his authorized representative established in the Community shall affix the CE marking to each piece of equipment and shall draw up a declaration of conformity. The notified body shall carry out the appropriate examinations and tests in order to check the conformity of the equipment, protective system or device referred to in Article 1 (2), with the relevant requirements of the Directive, by examining and testing every product as specified in Section 4. The manufacturer or his authorized representative shall keep a copy of the declaration of conformity for a period ending at least 10 years after the last piece of equipment was manufactured. Verification by examination and testing of each piece of equipment. All equipment shall be individually examined and appropriate tests as set out in the relevant standard(s) referred to in Article 5 ►C2 or equivalent tests shall be carried out ◄ in order to verify their conformity with the type as described in the EC-type-examination certificate and the relevant requirements of the Directive. The notified body shall affix or have affixed its identification number to each approved item of equipment and shall draw up a written certificate of conformity relating to the tests carried out. This module describes that part of the procedure whereby the manufacturer or his authorized representative established within the Community ensures and declares that the equipment in question is in conformity with the type as described in the EC-type-examination certificate ►C1 and satisfies the requirements of the Directive applicable to it. ◄ The manufacturer or his authorized representative established within the Community shall affix the CE marking to each piece of equipment and draw up a written declaration of conformity. The manufacturer shall take all measures necessary to ensure that the manufacturing process assures compliance of the ►C1 manufactured equipment with the type ◄ as described in the EC-type-examination certificate and with the relevant requirements of the Directive. The manufacturer or his authorized representative shall keep a copy of the declaration of conformity for a period ending at least 10 years after the last piece of equipment was manufactured. Where neither the manufacturer nor his authorized representative is established within the Community, the obligation to keep the technical documentation available shall be the responsibility of the person who places the equipment or protective system on the Community market. This module describes the procedure whereby the manufacturer who satisfies the obligations of Section 2 ensures and declares that the equipment is in conformity with the type as described in the EC-type-examination certificate. The manufacturer or his authorized representative established within the Community shall affix the CE marking to each product and draw up a written declaration of conformity. The CE marking shall be accompanied by the identification number of the notified body responsible for surveillance as specified in Section 4. The manufacturer shall operate an approved quality system for the final inspection and testing of equipment as specified in Section 3 below and shall be subject to surveillance as specified in Section 4 below. Under the quality system, each piece of equipment shall be examined and appropriate tests as set out in the relevant standard(s) referred to in Article 5 or equivalent tests shall be carried out in order to ensure its conformity with the relevant requirements of the Directive. All the elements, requirements and provisions adopted by the manufacturer shall be documented in a systematic and orderly manner ►C1 in the form of written policies, procedures and instructions. ◄ This quality system documentation must permit a consistent interpretation of the quality programmes, plans, manuals and records. — quality records, such as inspection reports and test data, calibration data, reports on the qualifications of the personnel concerned, etc. The notified body shall assess the quality system to determine whether it satisfies the requirements referred to in Section 3.2. It shall presume conformity with these requirements in respect of quality systems which implement the relevant harmonized standard. The auditing team shall have at least one member experienced as an assessor in the product technology concerned. The assessment procedure shall include an assessment visit to the manufacturer's premises. The decision shall be notified to the manufacturer. The notification shall contain the conclusions of the examination and the reasoned assessment decision. The manufacturer shall undertake to discharge the obligations arising from the quality system as approved and to maintain it in an appropriate and efficient manner. The notified body shall evaluate the modifications proposed and decide whether the modified quality system will still satisfy the requirements referred to in Section 3.2 or whether a re-assessment is required. The purpose of surveillance is to ensure that the manufacturer duly fulfils the obligations arising out of the approved quality system. Furthermore, the notified body may pay unexpected visits to the manufacturer. At the time of such visits, the notified body may carry out tests or arrange for tests to be carried out in order to check the proper functioning of the quality system, where necessary; it shall provide the manufacturer with a visit report and, if a test has been carried out, with a test report. — the decisions and reports from the notified body which are referred to in Section 3.4, last paragraph, Section 4.3 and Section 4.4. Each notified body shall forward to the other notified bodies the relevant information concerning the quality system approvals issued and withdrawn. This module describes the procedure whereby the manufacturer or his authorized representative established within the Community, who carries out the obligations laid down in Section 2, ensures and declares ►C1 that the equipment satisfies the requirements ◄ of the Directive applicable to it. The manufacturer or his authorized representative established within the Community shall affix the CE marking to each piece of equipment and draw up a written declaration of conformity. The manufacturer shall establish the technical documentation described in Section 3 and he or his authorized representative established within the Community shall keep it at the disposal of the relevant national authorities for inspection purposes for a period ending at least 10 years after the last piece of equipment was manufactured. Where neither the manufacturer nor his authorized representative is established within the Community, the obligation to keep the technical documentation available shall be the responsibility of the person who places the equipment on the Community market. The manufacturer or his authorized representative shall keep a copy of the declaration of conformity with the technical documentation. The manufacturer shall take all measures necessary to ensure that the manufacturing process guarantees compliance of the manufactured equipment with the technical documentation referred to in Section 2 and with the requirements of the Directive applicable to such equipment. This module describes the procedure whereby the manufacturer ensures and declares that the equipment or protective system which has been issued with the certificate referred to in Section 2 conforms to the requirements of the Directive which are applicable to it. The manufacturer or his authorized representative in the Community shall affix the CE marking to the equipment or protective system and draw up a declaration of conformity. The notified body shall examine the individual equipment or protective system and carry out the appropriate tests as set out in the relevant standard(s) referred to in Article 5, or equivalent tests, to ensure its conformity with the relevant requirements of the Directive. The aim of the technical documentation is to enable conformity with the requirements of the Directive to be assessed and the design, manufacture and operation of the equipment or protective system to be understood. If the marking is reduced or enlarged, the proportions given in the above graduated drawing must be respected. This minimum dimension may be waived for small-scale equipment, protective systems or devices referred to in Article 1 (2). — identification of the signatory who has been empowered to enter into commitments on behalf of the manufacturer or his authorized representative established within the Community. The body, its director and the staff responsible for carrying out the verification tests shall not be the designer, manufacturer, supplier or installer of equipment, protective systems, or devices referred to in Article 1 (2) which they inspect, nor the authorized representative of any of these parties. They shall become involved neither directly nor as authorized representatives in the design, construction, marketing or maintenance of the equipment, protective systems or devices referred to in Article 1 (2) in question. This does not preclude the possibility of exchanges of technical information between the manufacturer and the body. The body and its inspection staff shall carry out the verification tests with the highest degree of professional integrity and technical competence and shall be free from all pressures and inducements, particularly financial, which may influence their judgement or the results of the inspection, especially from persons or groups of persons with an interest in the result of verifications. The body shall have at its disposal the necessary staff and possess the necessary facilities to enable it to perform properly the administrative and technical tasks connected with verification; it shall also have access to the equipment required for special verification. The impartiality of inspection staff shall be guaranteed. Their remuneration shall not depend on the number of tests carried out or on the results of such tests. The body shall take out liability insurance unless its liability is assumed by the State in accordance with national law or the Member State itself is directly responsible for the tests. The staff of the body shall be bound to observe professional secrecy with regard to all information gained in carrying out its tasks (except vis-à-vis the competent administrative authorities of the State in which its activities are carried out) under this Directive or any provision of national law giving effect to it. ( 1 ) OJ No C 46, 20. 2. 1992, p. 19. ( 2 ) OJ No C 106, 27. 4. 1992, p. 9. ( 3 ) OJ No C 136, 4. 6. 1985, p. 1. ( 4 ) OJ No L 109, 26. 4. 1983, p. 8. Directive as last amended by Directive 88/182/EEC (OJ No L 81, 26. 3. 1988, p. 75). ( 5 ) OJ No L 220, 30. 8. 1993, p. 23. ( 6 ) OJ No L 24, 31. 1. 1976, p. 45. Directive as last amended by Directive 90/487/EEC (OJ No L 270, 2. 10. 1990, p. 23). ( 7 ) OJ No L 59, 2. 3. 1982, p. 10. ( 8 ) OJ No L 399, 30. 12. 1989, p. 18. ( 10 ) OJ No L 43, 20. 2. 1979, p. 20. Directive as last amended by Directive 90/487/EEC (OJ No L 270, 2. 10. 1990, p. 23).